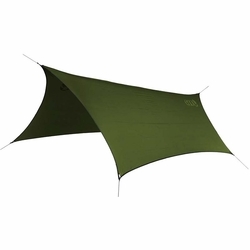 ENO ProFly Sil Nylon Rain Tarp. Sometimes porridge is just too hot or too cold. ENO makes it just right. Want sound, foul-weather protection, but not looking for a bomb shelter? Step under the ProFly Sil. The ProFly Sil's six guy points and sealed seams give it a streamlined shape ideal for weathering sudden downpours or building a water-front basecamp. Plus, the featherweight PU Coated Sil-Nylon is perfect for our ultralight friends out there. Eagles Nest Outfitters. Guy lines and stuff sack are included. Unfolded dimensions	(L x W) 10' 6" x 6' 4"